"You are far greater than you know, and all is well." In the 2012 Pulitzer Prize finalist Sons of the Prophet, the members of the Lebanese-American Douaihy family cling to this quote from their distant relation Khalil Gibran like a lifeline in the midst of their suffering. The also idolize the Lebanese Saint Rafqa, a 19th Century nun who prayed for suffering so she could feel closer to God. Being raised Catholic, I'm familiar with the idea of suffering as virtue, and I don't buy it. Suffering is not something to be sought after, it doesn't make us more pious. But let's face it, suffering is a part of life. We all suffer in different immeasurable ways. The suffering itself is not a virtue, rather it's how we're able to get through it and who we are on the other side that matters. 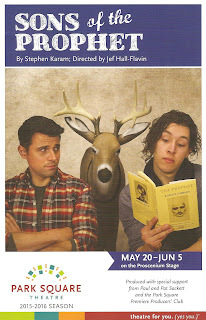 The Douaihy brothers endure their suffering with humor and compassion in this play full of quirkily endearing characters that ends with no resolution, only a promise of more suffering, and more life. Competitive runner Joseph is suffering from several mysterious ailments, including knee pain which has sidelined, or perhaps terminated, his running career. His doctors put him through a series of tests, eliminating one thing after another. He and his teenage brother Charles (who was born with one ear) are left orphans when their father dies after a freak accident (their mother having died years earlier). Add in their ailing (and horribly racist) uncle who moves into the family home, Joe's needy and eccentric boss, a public controversy about the young man who caused the accident, and a possible romance with a reporter who's covering the family tragedy... well, to say Joe has his hands full is an understatement. None of these things are resolved by the end of the 100-minute-no-intermission play, which left me feeling a little unsatisfied. But that's not a bad thing. 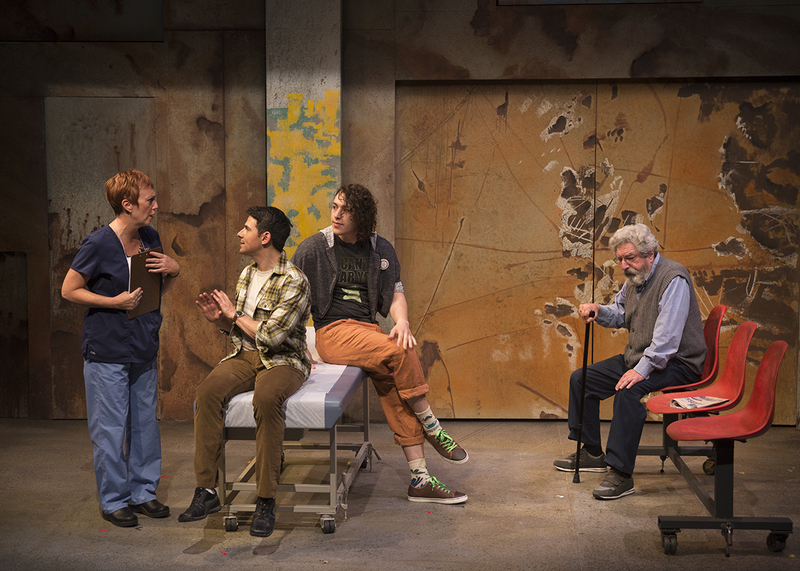 Theater isn't meant to provide all the answers, but rather to ask the questions in a compelling and intelligent way, which this play definitely does. 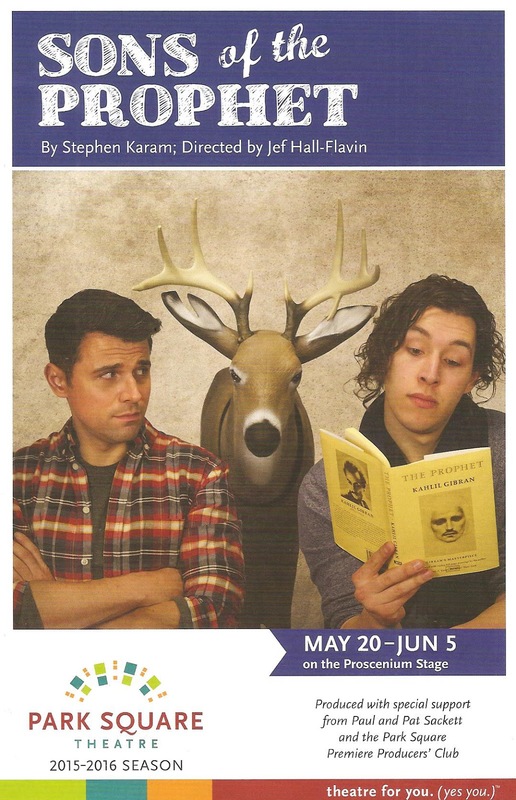 The strong eight-person cast under Jef Hall-Flavin's direction (who does an admirable job with all the moving parts and pieces) is led by Sasha Andreev (so charming in the recent one man show Buyer and Cellar). Joe is not the easiest character to like; he's guarded and argumentative, hesitant to let people in. But Sasha gives him depth and humanity, bringing out the audience's empathy for him. On the other hand, Maxwell Collyard's Charles is easy to like, the sweet kid who's perhaps a little lost but tries to be the peacemaker in the family. The two have a believable chemistry as the bickering but loving brothers. Angela Timberman is as hilarious as always as Joe's clueless boss, while also making the character more than just the annoying comic foil. Also great are Michael Tezla (my costar) as the curmudgeonly racist old uncle, Dave Gangler as the potential romantic interest (no spoilers here), and Ricardo Baeird as the young man who caused the accident (with a hilariously monotone reading of an essay). Sally Ann Wright and Patty Mathews ably fill in all the other roles, adding moments of humor or pathos. Joseph Stanley's scenic design is quite ingenious. 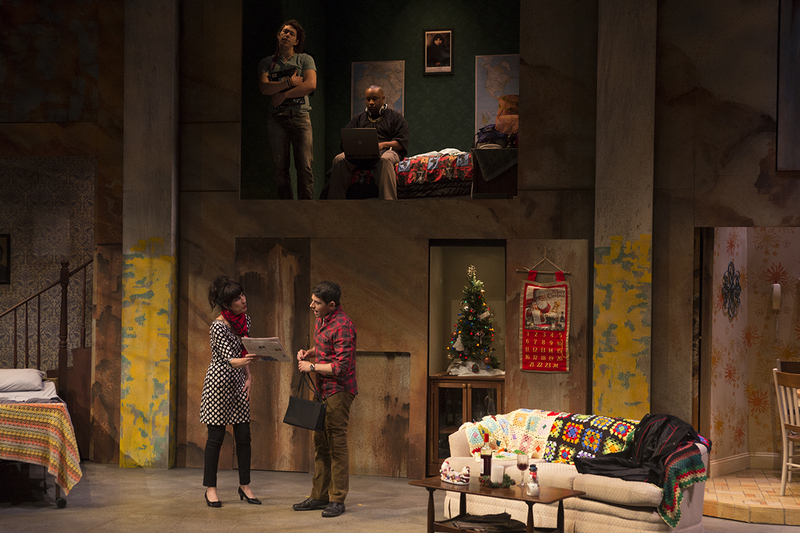 The mottled brown wall across the stage has multiple doors that open to reveal rooms or prop pieces, like an Advent calendar (which may be intentional; in one scene there is a Christmas tree and an Advent calendar displayed). An upper door slides open to reveal Charles' upstairs bedroom, doors on either side on the main floor hide the stairway and dining room of the family home, while hospital beds or other set pieces come out of smaller doors in the center. There's a lot of opening and closing of doors and moving things around, but it's very well choreographed and moves smoothly between scenes. As I've previously admitted on this blog, I am obsessed with all things Laura Ingalls Wilder, so I was thrilled when Joe and his potential romantic interest (did I mention both of the brothers are gay?) started discussing poor Mary Ingalls as an example of suffering (not only did she go blind, she was kicked by a horse requiring expensive emergency surgery, her baby died in a fire, and her blind husband regained his sight, leaving her feeling alone in the darkness - being in a frontier-set soap opera is tough!). Like the boys, Almanzo was my first crush too (and I still think Dean Butler is pretty dreamy). And like Joe, I'm also a runner (although never competitively) with bad knees who wears knee braces (although only while running). Needless to say Sons of the Prophet spoke to me on many levels. 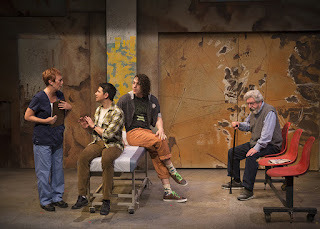 I wasn't quite sure what to think about this play when it ended without giving me an answer to Joe's medical mystery, or resolving the accident controversy. But think about it I did, and do (and it also led me to do a bit of research on Gibran, St. Rafqa, Maronite Catholicism, and Lebanon, topics I know next to nothing about). This is a super short run (of which nearly half of the performances were previews), so get there fast before it closes next weekend so see this funny, poignant, thought-provoking, compelling play.